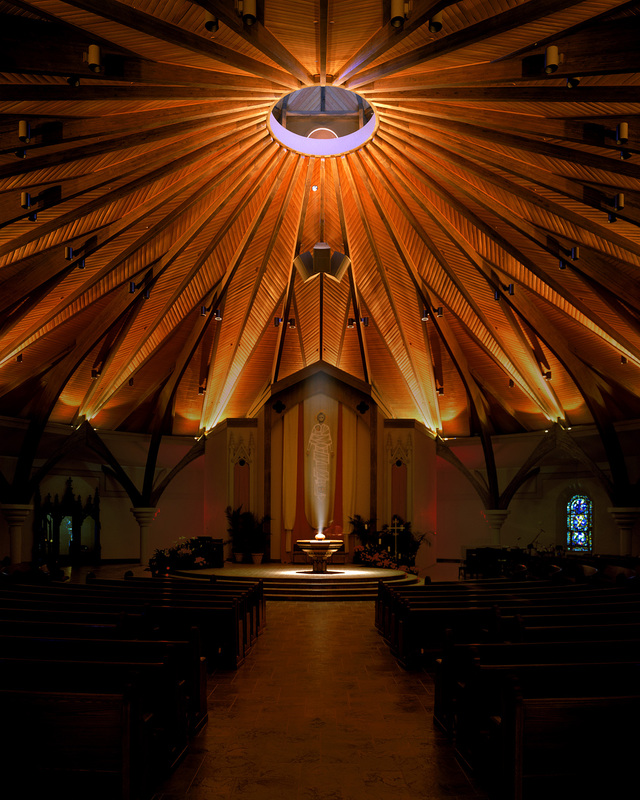 This new, sixteen-sided church seats up to 750 people and combines design elements of early Romanesque churches with modern liturgical space and contemporary materials. The existing church was converted to support functions for the new Gathering Space and includes a Kitchenette, toilet rooms, sacristy, Choir Room and a large meeting room. The Master Plan also includes improvements to the existing school and rectory. I first wrote about this project when I wrote to the editor of the Environment & Art Letter about the unique journey that we were on while designing this project. The completed project was later published in the same magazine in an article, entitled “Honoring Past, Present and Future”. A later article, entitled “Light from Above”, was published in Architectural Lighting magazine. This article focused on the award-winning lighting design. Finally, the project was profiled ten years later in Faith & Form magazine in this article entitled “Gothic Revival”. This project also received the 1999 Edwin F. Guth Memorial Award of Merit for Interior Lighting Design for lighting designer Naomi Miller, ASID.